Confessed al Qaeda conspirator Zacarias Moussaoui verbally attacked his lawyers Thursday as he testified in his death-penalty trial for his role in planning the Sept. 11, 2001 attacks against the United States. "You have put your vested interest in keeping this case in your hands, above my interest to save my life," Moussaoui said in response to questions from defence lawyer Gerald Zerkin. Zerkin had asked Moussaoui whether he believes his defence team is conspiring to kill him. Moussaoui told the court that if he'd had control over his defence, he would have argued that instead of being sentenced to death, he should be available for a prisoner swap if American troops are captured overseas. Moussaoui accused his lawyers of engaging in "criminal non-assistance." He said they should have tried to move the trial from Virginia because state jurors are more likely to give him the death penalty because of the state's proximity to the Pentagon. It was hit on Sept. 11, 2001, along with the twin towers of the World Trade Center in New York. He also criticized American support for Israel, saying Israel is just "a missing star in the American flag." He went on to say that Muslims have been at war with Christians and Jews for centuries, and that Islam requires Muslims to be the world's superpower. He read aloud passages of the Koran to support his assertions, citing one that requires non-Muslim nations to pay a tribute to Muslim countries. "We have to be the superpower. You have to be subdued. We have to be above you," Moussaoui said. "Because Americans, you are the superpower, you want to eradicate us." This was the second time in his trial that Moussaoui has testified against the advice of his court-appointed lawyers. 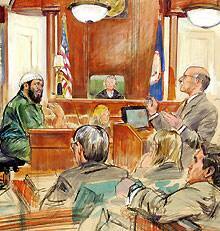 The first time, he surprised the court by saying he was to have flown a fifth plane into the White House on Sept. 11. That testimony came after years of denying any specific role in the attacks. Earlier Thursday, his lawyers had tried to persuade jurors to spare his life and instead put him in jail forever. The request followed Wednesday's riveting testimony during which the court heard the cockpit voice recording of the final 31 minutes of United Airlines Flight 93. The plane, carrying 40 passengers and crew, crashed into a field in Pennsylvania on Sept. 11, 2001. The transcript describes the sounds of al-Qaeda members taking control of the plane, and passengers and crew begging for their lives. It also gives insight into the struggle that preceded passengers overpowering the hijackers in the cockpit. That struggle prevented the plane from being used as a flying bomb. Moussaoui's defence team is expected to argue that his life should be spared because of his limited role in the 9/11 attacks. They are also expected to present evidence that he is mentally ill and that his execution would only give him the martyrdom he so fervently desires.